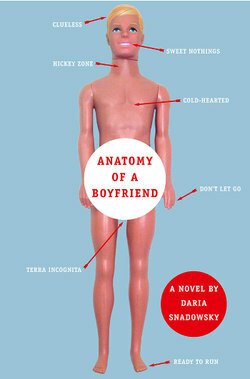 A Publisher's Weekly article notes that while the novel, Anatomy of a Boyfriend by Daria Snadowsky, has been well-received, the cover is stirring controversy in the YA book buying world. Some commenters on the PW article think the cover is inappropriate and amounts to "denegration [sic] of males." Others think it's just fine--one said "it’s a welcome change in this genre to see a male objectified on the cover, considering most covers show skinny, leggy girls, whose faces are often out of frame..." (she's refering to jackets like this). We simply admire the clever, attention-grabbing design....you may call us sexist if you must. The book's due out January 9, and we predict it'll sell like beefcakes. I laughed about the arrow pointing to "Terra Incognita". Hee.